Tartuffe, a production by “L’On Donne,” captivated its audience from opening night. 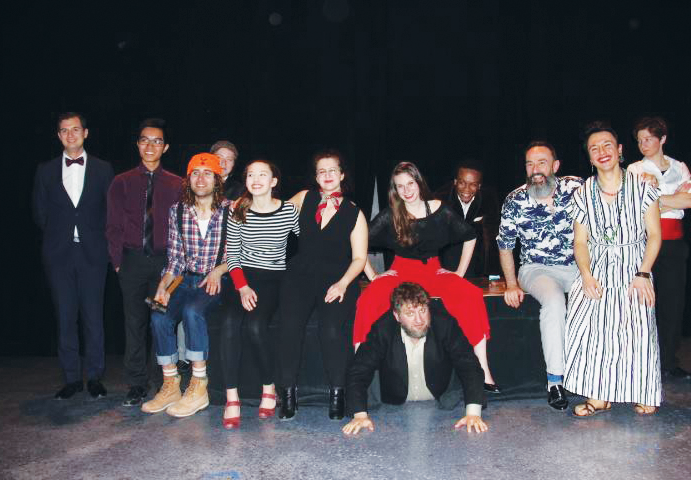 The play by Molière, directed by Mario Longtin, professor in the department of French studies at Western University, was presented between Mar. 20 and 24 on the McManus stage of the Grand Theatre in London, Ontario. Masters and Ph.D. students acted out this “diamond in the rough of french literature” (translated from French) with brilliance, Longtin said. This play was scandalous in the 17th century, telling the story of an imposter that passes off as a religious man in order to abuse an entire family. The scenario is still relevant and has the same impact today. “We live in a world of hypocrites and imposters,” Longtin said when explaining the relevance this play has to today’s society. “We never know if we are being given real or fake news,” he added. “In the beginning, when we thought about Molière, we thought it would be very serious and difficult to do, it’s truly a classic … and yet we created something that makes you laugh.” said Stella Pei, who played the role of Cleante. Often compared to Shakespeare, Molière continues to fascinate a contemporary audience by pulling the strings of comedy. The staging directions of Mario Longtin, sought to modernize the play and accentuate its farcical qualities. Many of the characters were rejuvenated, such as “the role of Damis which is [normally] played as a serious character,” (translated from French) as explained by Florian Ponty, the actor who played Damis. “We tried to rework the character so that he’d be more comedic,” (translated from French) he added. A large audience attended the premiere, on Mar. 21. Laughter could be heard within the first few minutes, and would continue uninterrupted until the end of the play. “Most excellent!” (translated from French) as expressed by Tetzner Bien Aime, the actor who played Tartuffe, when talking about the audience reaction. “It’s as if they were more connected than us” (translated from French) he added. “We played it so much that we stopped laughing at the jokes, but [the audience laughed] through the whole play” (translated from French) said Stella Pei. The enthusiasm of the audience contributed to the success of the night. It was a success well deserved. The cast and director Longtin put in great effort. The young actors truly channeled the characters of Moliere. They even took the liberty to reinvent certain scenes. One that stood out amongst others was the scene in which Tartuffe’s lies are revealed. In the original play, this provocative scene where the wife lures Tartuffe into unmasking takes place in a bedroom. The theatre “L’On Donne” relocated the scene to a gym, where the character performs a suggestive yoga routine. This works well and helps us relate to contemporary forms of exposure and discomfort. This year the theatre did not forget the youth. Friday morning, the theatre sold out with an audience of students from various francophone high schools in the region. The dynamism of the francophone culture in London is no Tartuffian sham!